Click here to see all 30+ of the free crochet patterns by Daisy Cottage Designs! This past week, I wanted a quick project to make for my oldest daughter. 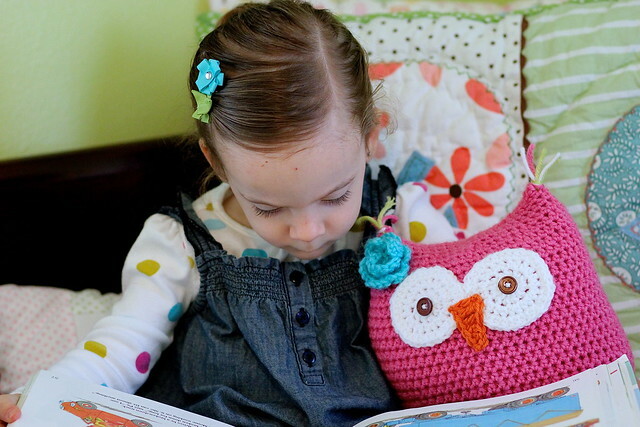 Riley loves pink and I like to think that she loves owls (even though I’m the real owl lover around here). I’d seen a couple free owl patterns floating around, but none of them was exactly what I was looking for. I whipped up this adorable little owl in just a couple hours. For once, I wrote down the pattern as I went. For the body and legs, you’ll use the G crochet hook. For the eyes, beak, and flower, use the H hook. Round 3: ch 1. 1 hdc in the same stitch, 2 hdc in the next. *1 hdc in the next stitch, 2 hdc in the next* around. Sl st to the top of the first hdc. Fasten off. Leave a long tail for sewing on the toy. Row 1: sc in the first stitch, hdc in the next stitch, dc in the next stitch, tc in the remaining stitches. Fasten off and leave a long tail for sewing on the toy. Finish stuffing legs and sew on the base of the owl. Row 1: SC in the second ch from hook. *ch 2, skip 1, SC* around. SC in the last ch. Row 2: *Ch 2, 4 DC, ch 2, sl st* in the first chain loop and in each chain loop until you reach the end. Leave a long tail. You should have been creating a spiral of petals. Once you’re finished, arrange your spiral into a flower and secure with the tail. After you secure the back, sew it on the body of the owl. Stuff your toy (pretty firmly) and whip stitch the top closed. Add tufts of yarn to the corners to define the owl’s “ears” a little and pass your creation on to an owl lover you know and love. Thank you! This makes my day! If I feel better, I shall accomplish this and post it! Love this, thanks for the tutorial. However I will not be making toys I&#39;ll be going slightly larger as I fancy some new cushions instead . Watch this space. This is sooooo very cute! Thanks for the free pattern!! Blessings..
Hey Lauren. 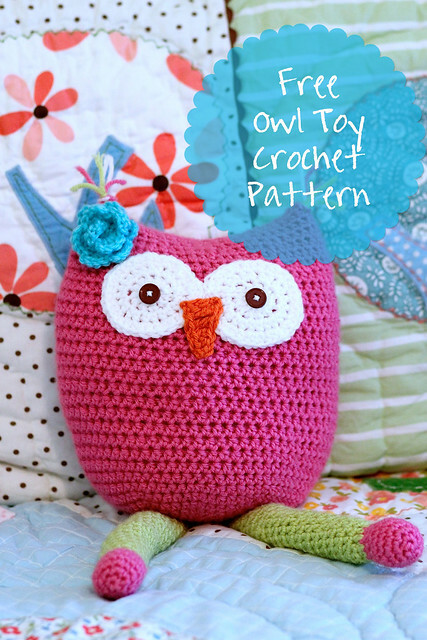 Your adorable owl softie is being featured at Tangled Happy tomorrow. I love him… And I think our readers will love him too! Thanks for sharing another great free pattern. So nice! Thanks for the pattern – so cute and I want to make it. I have a few questions about this pattern….I am trying to make this for my sister for her birthday. At the end of each row do I turn or do I just keep crocheting in a circle? This is so adorable! I&#39;ve pinned this! Thanks for linking up at my <a href="http://www.dianarambles.com/search/label/Pin%20Meme&quot; rel="nofollow">Pin Me Linky Party</a>. Do you slip stitch at the end of each round????? I have the same question and Meghan. do you crochet in the round or turn and go back and forth. I am on the fourth row and though I should find out before I get much further. Thank you so much for the pattern, I know I will enjoy whipping this up. Pamela, no need to turn. Just use a marker at the beginning of each row. Hi Lauren! Thank you for this pattern, this cute owl is one of my favorite gifts to give at a baby shower. It is always a hit! I would love to get your permission to sell the finished product in my etsy shop, and would credit you with the pattern design.